Hi everyone…can you believe my card was hacked?. You hear about these things happening, like your identity being stolen or your card being hacked but you never think it would happen to you. I have to admit though that as I was doing more business online via the blogging, setting up my Etsy shop and having to ensure my sites are well done and presentable I was registering for more platforms that had to help me do all the different aspects of a website, my mind ran on whether my card would get hacked. But I thought I was safe well it seems I wasn't. The worst feeling in the world is when you use your credit card and it’s declined when you know it has money on it or at least supposed to, not only that, you know you haven’t reached your limit or gone on any shopping sprees, so whats going on? So I did some research because I realised that something was wrong so I checked my account only to see a set of transactions a that I definitely did not do, especially as I live in Trinidad and these were transactions that took place in California. It will then take 2 and a half months to know the results based on their investigations. Still no surety that I would get it back. They stole $750USD, most of which belongs to my daughter, so I definitely want it back. It’s a shame I’m not a hacker so I could go online myself and find the thief and make them pay for what the've done. Cyber crime is just to difficult to solve, it makes you feel helpless and there is so much of it going on today. 2. Skimming. A credit card skimmer is a small device that captures your credit card information in another otherwise legitimate transaction. Thieves secretly place credit card skimmers over the credit card swipe at gas stations and ATMs then return to retrieve the information captured. Sometimes a counterfeit credit card ring recruits cashiers, waitresses, or other workers to skim customer credit cards. You hand your credit card to the cashier for processing and when you’re not looking, the cashier will swipe your credit card through the skimming device. 3. Installing malware or viruses on your computer, tablet or smartphone. Hackers can design software that’s downloaded in email attachments or other software and sits on your computer undetected. In one instance, hackers take advantage of public wi-fi to trick people into installing malware disguised as a software update. The software monitors your keystrokes or takes screenshots of your page and sends the activity to the thief. 5. Old-fashioned dumpster diving. Throwing away documents or receipts that have your full credit card number printed puts you at risk of theft. While dumpster diving doesn't happen as often as in the past, it's still important to be aware of the possibility. Always shred these documents before tossing them in the trash. Unfortunately, you can’t control how businesses dispose of their records. If they fail to shred records that contain credit card information, the information is at risk of being stolen. 1. Use it to make online purchases. Thieves can use your credit card information to buy things over the internet. 2. Sell it. Credit card information can be sold over the internet for $5 to $100 in the U.S., depending on the type and amount of information that’s sold. 3. Create cloned credit cards. Thieves can make legitimate-looking credit cards by programming your credit card information on a gift cards or prepaid credit card. When the card is swiped, the transaction processes just like it would if you swiped your actual credit card. · Immediately report fraudulent purchases, regardless of the amount. · Read through your transactions once a month when your credit card statement comes. · Once a week is better and daily or every other day will let you spot fraudulent purchases before the thief can do too much damage to your account. · Some credit cards can send real-time transaction notifications to your smartphone. · Don't ignore small, seemingly innocent credit card purchases. Even something as small as a few cents could be a sign that your credit card information has been compromised. · Pay attention to news regarding hacks and data breaches. News reports will often include the name of the store affected and the date or date range the data beach occurred. If you shopped during that time period, there’s a chance your credit card information was stolen. · Avoiding storing your credit card details in your web browser. · ITunes, and other accounts. Call your bank or card issuer and request a new credit or debit card. If a debit card was involved, you'll also want to change the PIN on the account. Some banks and issuers automatically shut down your card and send a new one when they know it's been compromised. You'll also want to check bank and credit card statements for suspicious activity or purchases, as well as going online to check recent activity. If your card is used before you're aware of the data breach and its used by a thief, you'll need to make sure you dispute the charges with your bank or card issuer immediately. Your next step is to change your passwords on those accounts, as well as the password to any account that's been breached. If you re-use some form of those passwords on other accounts, it's a good idea to change those, too. 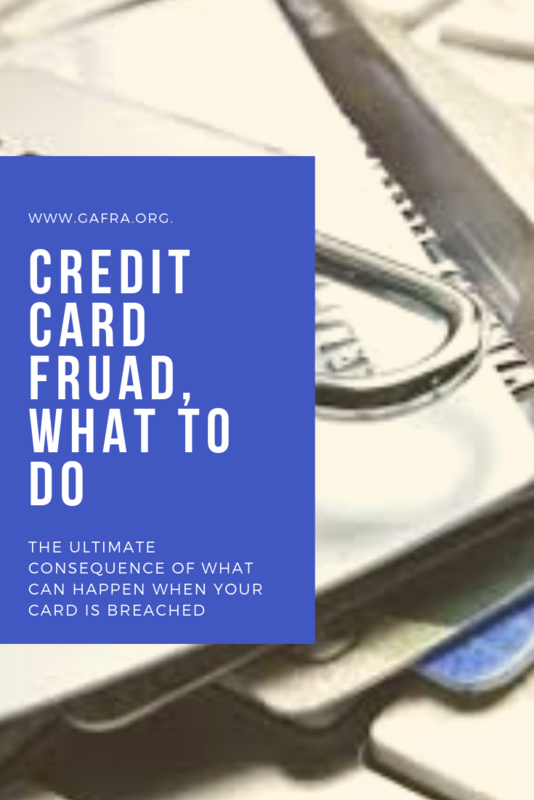 Assuming you've reported any unauthorized transaction immediately to the credit card or debit card issuer and since a card can easily be canceled, you may not need to take additional action other than keeping an eye on your card statements and credit reports. 1. Yes, it’s serious, but don’t panic. 2. Call your bank and the credit reporting companies. 3. Send written notification to your creditors. 4. Monitor your statements and correspondences.